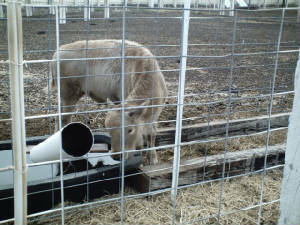 On May 16, 2005 a few minutes before noon a White Buffalo, Hiawatha, was born to White Buffalo Miracle Moon and Willy Wonka, a brown North American bison. Says Dena Riley of Spirit Mountain Ranch in Flagstaff, Arizona, "The birth of a white buffalo is a rare occurence indeed. Only one in 10 million buffalo is born white." Jim and Dena Riley of Spirit Mountain Ranch are now the caretakers of seven White Buffalo: Miracle Moon, Rainbow Spirit, Mandela Peace Pilgrim, Arizona Spirit, Sunrise Spirit, Spirit Thunder, and now Hiawatha. 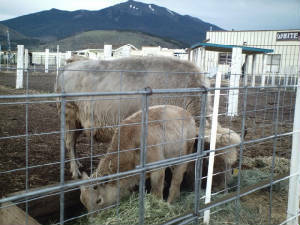 "Miracle Moon, our first White Buffalo and now a mother, was born on April 30, 1997. Miracle Moon gave birth to Rainbow Spirit (female) on June 8, 2000; to Mandela Peace Pilgrim (female) on July 18, 2001; and to Arizona Spirit (male) on July 1, 2002. All these babies were fathered by Willy Wonka. And now the babies are having their own white babies." On May 22, 2004, "Mandela Peace Pilgrim gave birth to Sunrise Spirit (female). Five days later on May 27, 2004, Rainbow Spirit gave birth to Spirit Thunder (male). 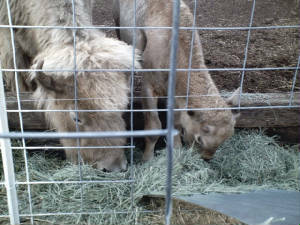 Both these white buffalo babies were fathered by BlackJack, a dark-brown Canadian Bison." "This is Miracle Moon's fourth white baby. My husband, Jim, watched with binoculars from the window and when he could tell she was getting close he took a bale of hay and circled all around her and she seemed to be very happy that he did that and she moved the hay around and had the baby on the hay. Of course, she had no problem whatsoever." Dena says Jim "knew right away it was going to be white. All of our white ones are born red. They have white on the tips of their ears, white around their eyes, on their chin, their legs, their hooves are even pink and then they have white underneath their tail. That's how our white ones are born." 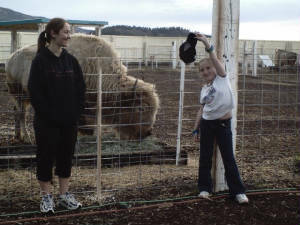 The Rileys have the only DNA-tested White Buffalo tested by Stormont Laboratory in Woodland, California. "We had Miracle Moon tested not once but twice because people were sceptical. We DNA-tested her two daughters and Willy Wonka. Claude Stormont took it upon himself to do the most intensive testing they could to look for cattle markings in their blood and couldn't find any." In fact, Dena says, "Miracle Moon was the only one the lab had tested that turned out 100 percent buffalo." Dena says while in the 1800s there were between 60 and 120 million buffalo, by 1900 there were less than 500 true buffalo since cross-breeding of buffalo and cattle began in 1897 creating 'beefalo'. Recent DNA tests on the 150 buffalo at the rim of the north Grand Canyon revealed only one pure buffalo, said Dena. Of the million or so buffalo alive now, knowing which are pure is only determinable by DNA testing. "Having seven in the same herd is a phenomenon in itself and we're not doing anything special other than loving and protecting them. That's our obligation to Great Spirit to take good care of them and make sure no harm would come to them." Another White Buffalo, an albino, White Cloud, born March 27, 2000, lives in South Dakota. Whether White Cloud is, in fact, pure bison appears to be in question. White Cloud has not yet reportedly been DNA-tested. So, whether or not White Cloud is indeed full bison will determine whether Hiawatha is the seventh, or eighth, living White Buffalo. The White Buffalo, Miracle, born August 20, 1994, died September 19, 2004, and Medicine Wheel, born May 9, 1996, died March 27, 2005. "We knew Hiawatha had to have a very special name being our seventh White Buffalo and this lady came and talked to us when he was three days old. She said, 'Well, you know of Hiawatha' and my husband said, 'I know the name but I don't know the significance." Dena explained by phone from her ranch near Flagstaff, Arizona, that research has shown Hiawatha lived in the late 14th century and was important to the formation of the legendary Iroquois Six Nation's Council formed about 1390. "The name represents a peacekeeper, a peacemaker. Hiawatha would spend his time going from village to village spreading the good tidings of peace and power so the children of the future would live in peace." Hiawatha was instrumental in the creation of the Peace Tree and in the burying of the weapons of war beneath the Peace Tree by the League of the Five Iroquois Nations. 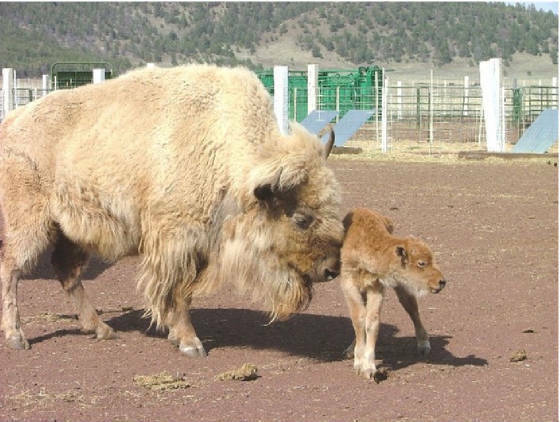 Should new white buffalo calf on the block, Hiawatha, prove to be the eighth, rather than the seventh, living White Buffalo, the 8th hexagram of the ancient Chinese I Ching, Pi/Holding Together [Union] states: "Symbolically this connotes holding together and the laws that regulate it." As the judgment says, "Holding together brings good fortune...What is required is that we unite with others, in order that all may complement and aid one another through holding together. But such holding together is a grave matter and fraught with responsibility. It requires greatness of spirit, consistency and strength. Therefore let him who wishes to gather others about him ask himself whether he is equal to the undertaking, for anyone attempting the task without a real calling for it only makes confusion worse than if no union at all had taken place." The historical figure, Hiawatha, appears to have embodied the essence of hexagram 8; it remains to be seen whether his White Buffalo namesake has the same unifying effect. 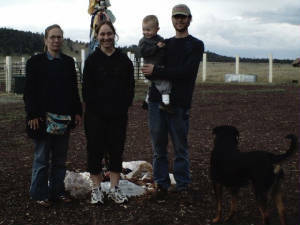 The Rileys have people from all over the world come to visit the herd of White Buffalo. "People have had visions or dreams, and they end up on the doorstep of the White Buffalo Ranch and people are amazed. These buffalo are magnets." When Sunrise Spirit was born on May 22, 2004 "she was our whitest baby we ever had; she was a peach color, and she got world-wide news. She was on CNN, Paul Harvey, Good Morning America and in May we also had a visit from Tom Green of the Tonight Show with Jay Leno. We got the most interesting place in Arizona on the Tonight Show, and then five days after Mandela Peace Pilgrim gave birth, her sister Rainbow Spirit and BlackJack gave us a white son named Spirit Thunder and that was May 27, 2004." The White Buffalo come on the birthdays of significant spiritual leaders: "Willy Wonka and Miracle Moon had their first daughter, Rainbow Spirit, June 8, 2000. There was a rainbow that went completely over the property when she was one hour old and that was how we named her." Miracle Moon was born on Chief Arvol Looking Horse's birthday [Chief Looking Horse is the pipeholder of the White Buffalo Pipe given to the Lakota Sioux by the legendary White Buffalo Calf Woman some 2000 years ago]; Rainbow Spirit, her first daughter, was born on Stanley Looking Horse, Arvol's father's, death day; he'd died two years before she was born." Mandela Peace Pilgrim was born on the birthday of Nelson Mandela and the Peace Pilgrim as well as on Princess Diana's death-day while Arizona Spirit was born on Princess Diana's birthday. Dena says the Rileys haven't publicicized the birth of Hiawatha: "we let it happen in a dignified and honoring way." When asked why the White Buffalo came to them, Dena said, "We're honest, we're giving, we're both Leo's, we love to give, and we love people. We're mixed color: we both have Cherokee and Irish in us. The people who have these buffalo had to be mixed blood to understand both sides. We love the Native side of us as well as the Irish side of us. I've always said I believe that Jim became their father protector when he put his life on the line to save Miracle Moon's life." "We had a young bull in our pasture and the young bull flipped Miracle Moon fifteen feet in the air when she was still in her birth sack. That's how we named her Miracle Moon because she was a miracle she lived." Jim Riley intervened and saved the calf "and had he not saved her life that day we would never have known she was going to be white because she was born red." The bull that attacked Miracle Moon later saved her from a cougar. Feeding the buffalo "runs about $1,000 to $1500" including hay and grain Water is hauled in. 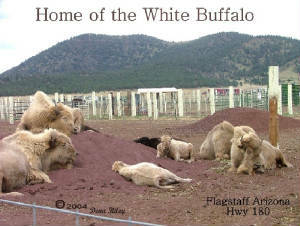 The Riley's have a gift shop, living quarters and a herd of seven White Buffalo. 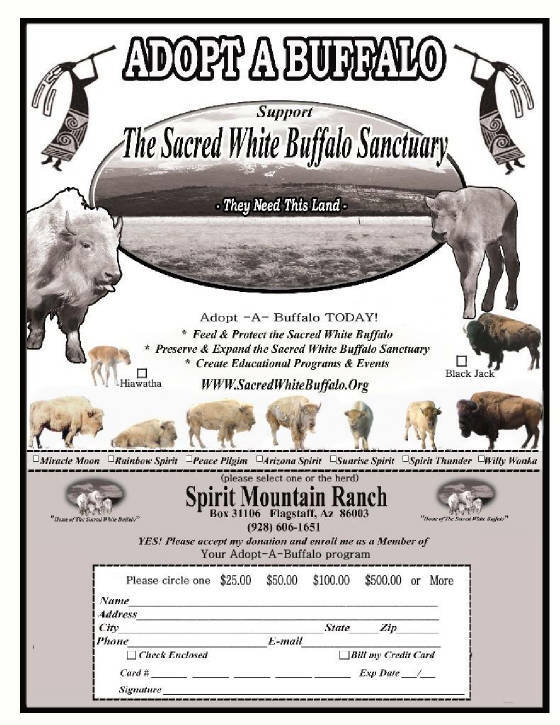 People from around the world can adopt one of the buffalo or the whole herd to help with the cost of feeding the sacred seven. "I make a certificate up with their animal(s). It has the picture right on the certificate. A lot of people adopted the babies last year." Dena isn't sure how many have adopted so far. "I have to count. I really don't know. I've got each one on their own list. What I do is put each one of them on a picture of a buffalo and I tape them to our entryway so we know which person from which state adopted which buffalo." Dena and Jim Riley see themselves as the "grandparents of this herd" and Dena says, "We want the best for the herd and we want them to remain a herd." Asked how she sees the White Buffalo effecting the world, Dena said, "Well, I see a lot happening here. I see people right here coming together which is a beautiful feeling. 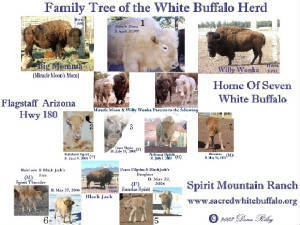 People from all over the world come here" and as far as what "are the White Buffalo's job duty? They're doing their job every day of their life when people come to see them." Says Dena, "These animals are the most special thing in the world. There's no better feeling in the world than to be part of the White Buffalo family." Dena mused, "We are all one. We are all related. We should all love each other as such. I have Cherokee in me but to look at me you can't see one shred. I'm a red-headed, pale-faced little short woman. My husband looks more Cherokee." Dena describes the video birth of Rainbow Spirit. "Jim just let the camera run from the time the hooves start coming out and then she tries burying her head in her daddy's chest to find milk and falls to her knees, and he reaches down and gives her a kiss; he licks her to say, 'welcome, my daughter', this big huge dark buffalo, kneels down to kiss his little girl. So, we're very proud of what we've been able to accomplish in nine years. All we can do is say 'what is this all about?' There's got to be a reason all this is happening. They do mean prayers are being answered. Prayers all over the world are being answered. All we do is wish for the best. We have such beautiful people all around the world from all races and religions and we're so blessed to fill these shoes and to be part of the White Buffalo. You have to be patient and know that the answers will come." An all-day United Native Nations Celebration of the Birth of the White Buffalo, Peacemaker, Hiawatha, a W.B.N. Presentation, (W.B.N. Inc. is "dedicated to protect, serve and cure the Sacred Hoop of Life") June 28 at the Battle Mountain Civic Center featured internationally-renowned Nepalese flautist, Manose, with keyboard artist, Anton Mizerak, and vocalist, Natalie Gougeon, both of Mt. Shasta, California, from 7 to 9 p.m.. Manose's music was accompanied by the Nevada nature photos of Richard Primus. A country-western-rock dance followed from 9 p.m. to midnight featuring award-winning Nevada Native band, Stampede. Time is now twelfth hour is here the awesome transformation brings natural fear while we continue the cycle of morning and night surviving and complying caught in the plight. Time to raise your hands to heaven. Time to reach your voices to the sky great shift is coming to illusion we must die. Had we done different in the course of human time perhaps we'd have avoided this purification rite. No hills to run to no cover to take as Earth Mother readies to shake to shake. Earth Mother holds the rattle and sings the sacred song of purification, righting old wrongs and the days go by unheeding unconscious of the time caught in the play's illusions unaware of unpaid crimes. Earth Mother holds the rattle and sings the sacred song of final purification, righting ancient wrongs. Sing a prayer for salvation for sanctification and release as Earth Mother shakes the rattle praying for her peace. Giving back in kind what's been given her, don't be surprised when the spirits cry as she does what she must do. Earth Mother holds the rattle and sings the sacred song as we scatter like pebbles tossed upon the shore. Earther Mother holds the rattle and sings the sacred song, prepare for tribulation it won't be very long.